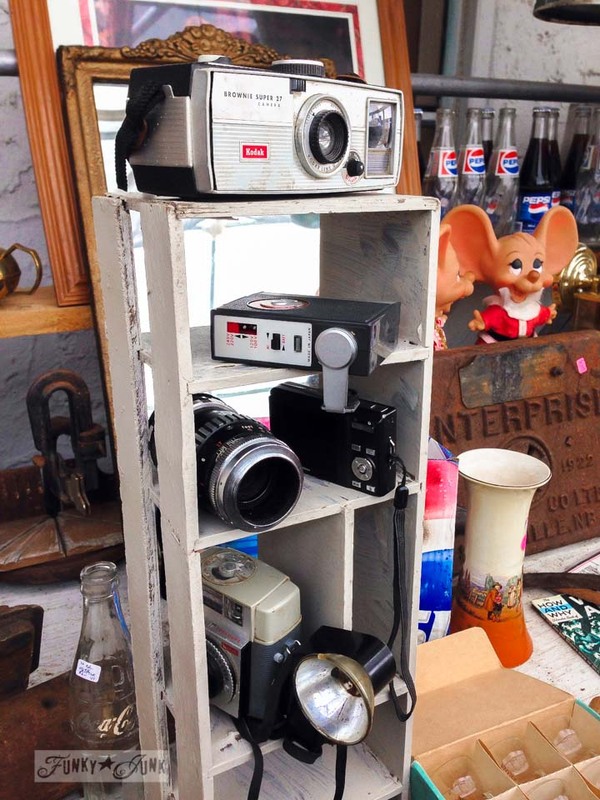 Junk finds… what would you do with ? This past week, I snuck over to spec out the new junk treasures at the new and used. I even came home with a few of them! Junk finds… what would you do with ? Wanna play? Join in the comments with your ideas! This cool little metal box was one of them. It reads Ansco and it plugs into the wall with red and white lightbulbs inside. Strange! Any idea what it is? I have visions of just hanging it up on the wall with like minded metal toolboxes and such, kinda like this cupboard wall gallery. This galvanized watering can also caught my eye. With spring right around the corner, I thought this would look adorable on the patio. Or inside. Probably inside. Maybe a spring centrepiece? 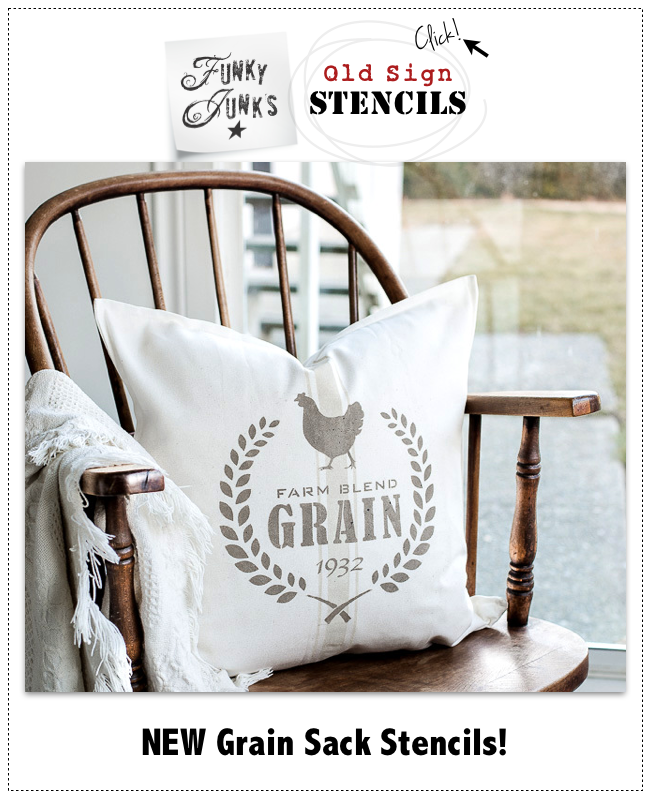 Or just might hang it up over my kitchen windows with the Farmer’s Market sign like I did during Christmas. This beat up little gas can has caught my eye a few times, but it was due to come home for good this round. I just loved the rusty top and blue stripe! Wouldn’t it make a cool lamp base? I need a welder in my life. Ok, I know! It’s ‘only’ a trouble light! But it inspired me. Could you imagine a really old rusty one or two hung up as wall lights somewhere for a little junk quirk? I just found it amusing the store used it for an outdoor light on a wall. And then I thought it was genius. No fancy wiring needed! Haha, well, these actually made me laugh. They were cool! But wow… where would one put all of these? They remind me of a trip I made a LONG time ago to Leavenworth in Washington. Ever been there? Amazing Bavarian styled town. Off topic! What would I do with these? I think I’d just enjoy them where they are. But the odd one could be cute as a little vase perhaps. Drawing a blank. What would you do with them? These were fun! I think they’d just be fun to have a round as part of a collection, but maybe you can think of something cool to use an old camera for? I’m thinking these things may have something to do with hauling hay. Hooking bales? I don’t really know. They were tempting to grab, but were a little too pointy for safety sake. But they sure were cool! Holding towels would be neat if the tips were rounded off a bit more maybe. This entire collection of black and white models were really well done, but the coroner made me laugh! But they sure would have looked cute mounted on a wall in a boy’s bedroom or playroom. Maybe on a painted road? Fun! There may be a better name for these, but wow… there were stacks and stacks of these restaurant quality dishes. It was tempting to grab a few. I just may go back. I love a good white dish and these had that bulk if you know what I mean. Hmm… even a stack for the trailer for camping… thinking here. Sure beats Corelle! 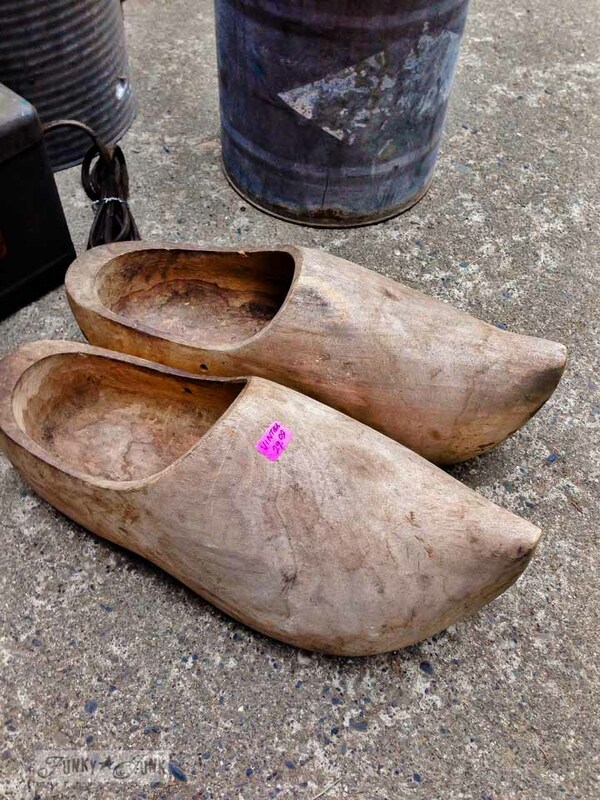 And yeah… these wooden shoes? I am head over heels in LOVE with them just as they are. So much so I ended up hanging them on the wall with a spring theme going on HERE. But wouldn’t they also be rather cool hung the other way around illuminated inside for quirky mood lights? I didn’t get all of these things obviously, but the ones I did will have to hang tough until next week. On Thursday I’ll be busy whipping up some new toolboxes and kits for the Fraser Valley Women’s Expo I’m speaking at on Saturday. Ok, so it’s your turn! Feel free to cut and paste the list in comments below and play along if so desired! I have made a table lamp from an old camera. It was REALLY cool! The Bavarian kitchen? I would LOVE a find like that! A quick google search turned up an Ansco 5 x 7 contact printing box for your metal box. Imagine, a photography related item – how neat is that? Good morning, Donna. What a haul! Here are some thoughts. Water can, possibly upright on a pedestal or hung outside your front door as a mail box. 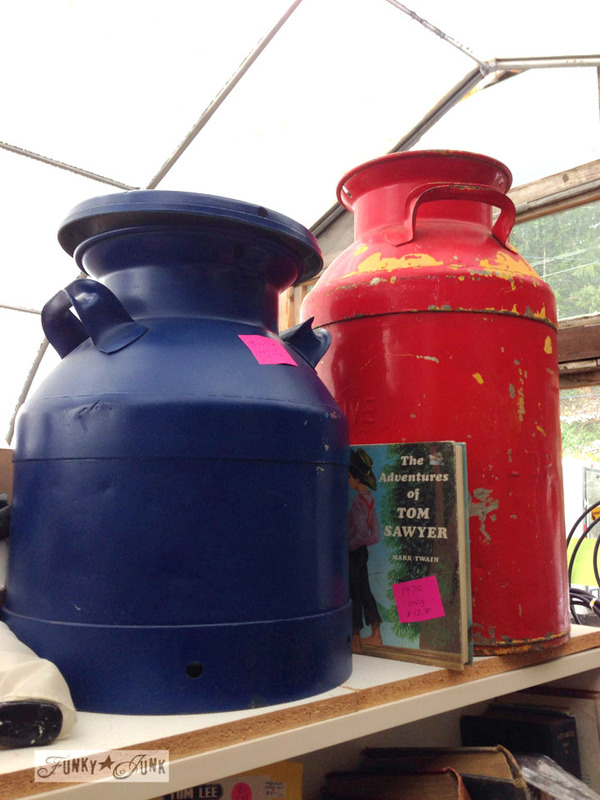 Gas can… a large vase for a budding branch, sunflower, what have you. 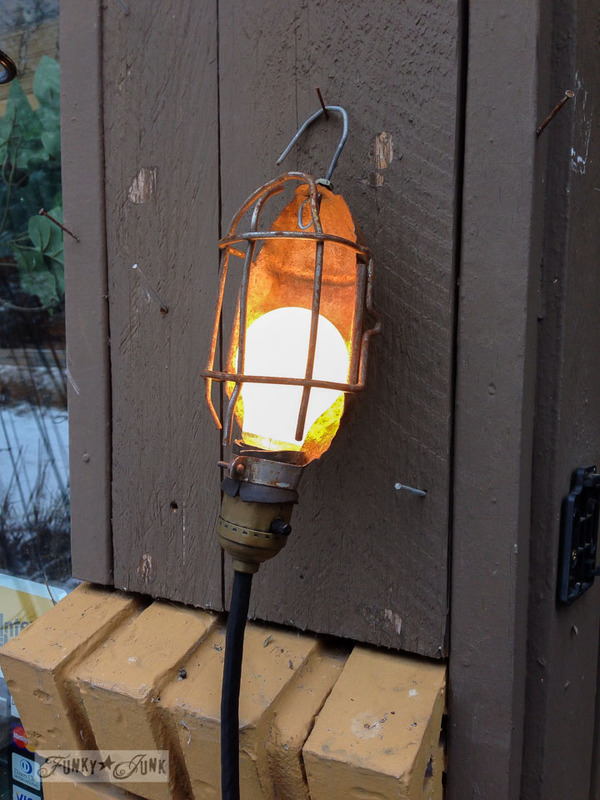 If it can’t hold water, and it is rusted on the bottom, put a drop lamp in from the top, drill holes all around the side, and open the bottom for a light fixture. Trouble light… replace bulb with an Edison style and hang it on the wall. It’s perfect as is. Rusted hooks… hang them on a beam and admire their intended form. Restaurant dishes… use them as they don’t make them like this anymore. Milk cans… beverage cooler on your deck for your future summer soirees! I have a friend looking for a set to hand an old ladder on the wall above her steps with. I used to have two sets-adult and child wish I still did 🙁 I would fill with moss and eggs and set next to the watering can in which I would put tulips and use for center piece on table. arrange on book shelves with books and black and white family pictures. Ohhh I love the idea of arranging the cameras with old black and white photos! Great call! Well the blue containers with the lids would be great for storing compost in the kitchen before heading outdoors with it. I found a cookie jar yesterday at my favorite junk store that was perfect for that same purpose. I was pleased no more plastic containers on my counter. I would have tried to buy all the white restaurant dishes! I’m such a dish fanatic. I’d use them to serve and eat lunch for my lunch bunch buddies. I’d do a gallery wall with few punches of color. I’d make bird feeders and other garden art. Oh, but I’m just getting started. I, too, would take home the galvanized watering can to join my collection of galvanized goodies on my porch. I’d fill it with English Ivy and love every minute of having it. Using the light on my porch would be a plus. Sleeping the crazy hours I do I’m often outside reading or journaling when it’s still dark and that light would be cooler than the lamp I use now. The cameras would find a home in my apartment as bookends. They look good in almost any position and would keep my books from getting warped and look truly wonderful. I’m having fun just dreaming. Thanks, Donna, for the fun I’ve just had! The metal box is a vintage Ansco photo developing box…right up your alley! I think the hooks could be ice block hooks! They would look good hanging anywhere! Safely of course!! Imagine!!! hahaha I think I need those hooks! Those hay hooks would be perfect on a porch with a hanging pot of flowers… but I’m loving the matching pair idea holding a ladder for hanging pots or whatever…. We are channeling the same junk I think. 1. Metal box: Since it already plugs in, I think I need a metal box charging station, like your toolbox one. 2. 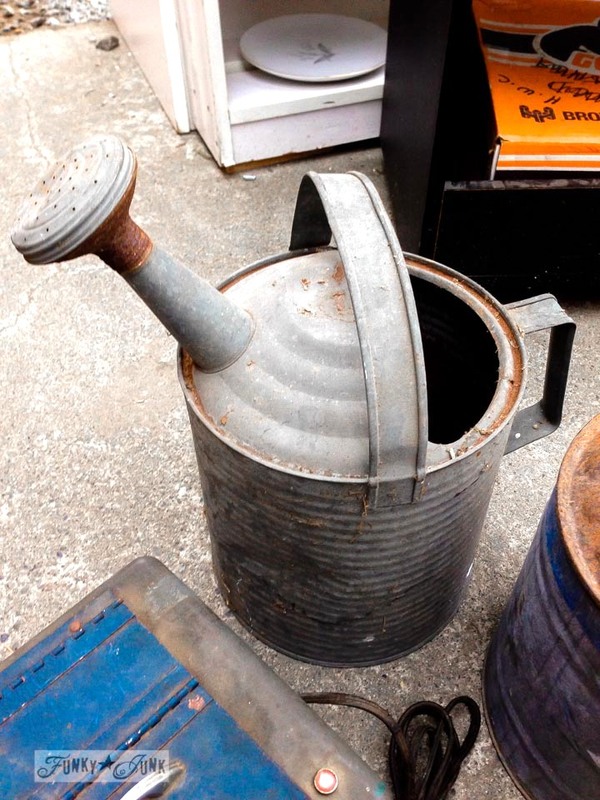 Galvanized watering can: This would go with my collection waiting to be hung on my shed. 3. Gas can: Same as above. 4. Trouble light: This would go in the garage and disappear like the other two I bought. The men folk think they are nothing more than trouble lights and use them. 5. Bavarian Kitchen Circus: Not coming home with me. 6. Vintage cameras: Odd, a friend called me yesterday to see if I wanted two of her old ones. I said yes of course. Guess they can sit in a box at my house just as easy as hers. 7. 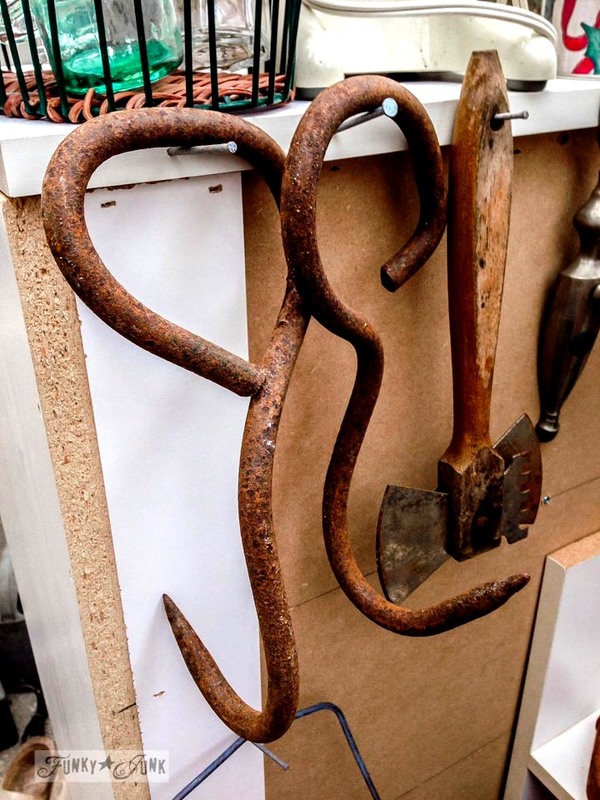 Rusty hooks: well I have a rusty hook holding up a memo board, and they look similar to tongs, so maybe a toilet paper holder. A dangerous toilet paper holder. 8. 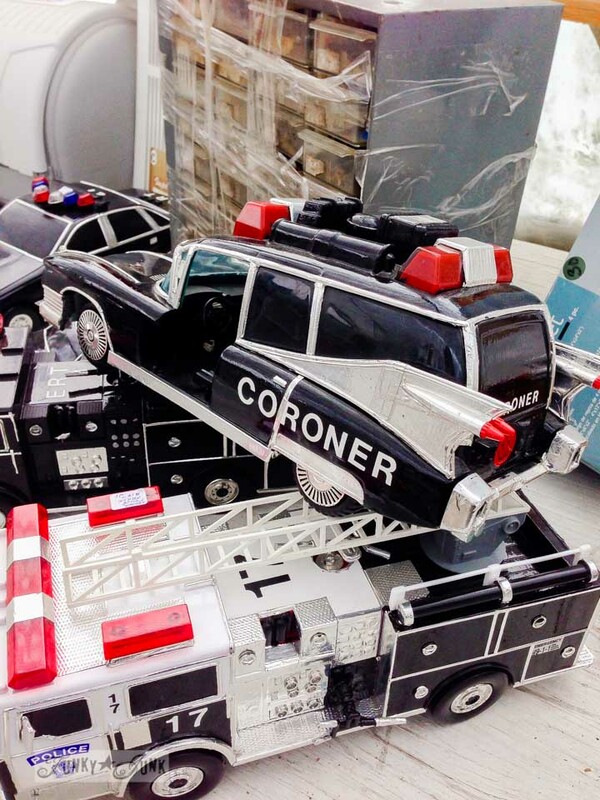 Model cars and trucks: I want that coroner hearse. That would go on the food table at a Halloween party. 9. Restaurant dishes: The dishes could stay. I have a shelf in the garage that holds 300 plates for mosaics, I need not more. 10. Milk cans: The same friend that asked if I wanted the cameras forced a nice milk can on me too. I already have many of those, but what’s one more right? 11. Wooden shoes: I’ve been trying to give away the one wooden show just like that. Maybe today I’ll hang it on my wall for scissors. We’ll see. Donna – I love the watering can. One cannot have too many of those beauties. And the hooks with their rust would be hung as plant hooks (and yes I would file down the sharp points!) I like the milk cans and haven’t thought about using as plant stands…they would be great on my back porch (I love red and blue). The barvarian circus would not be coming to my town…too much fun! And the restaurant dishes, sadly I don’t care for them…too much bulk. A hay hook would be great to hang on the side of your house for a water hose. 1. 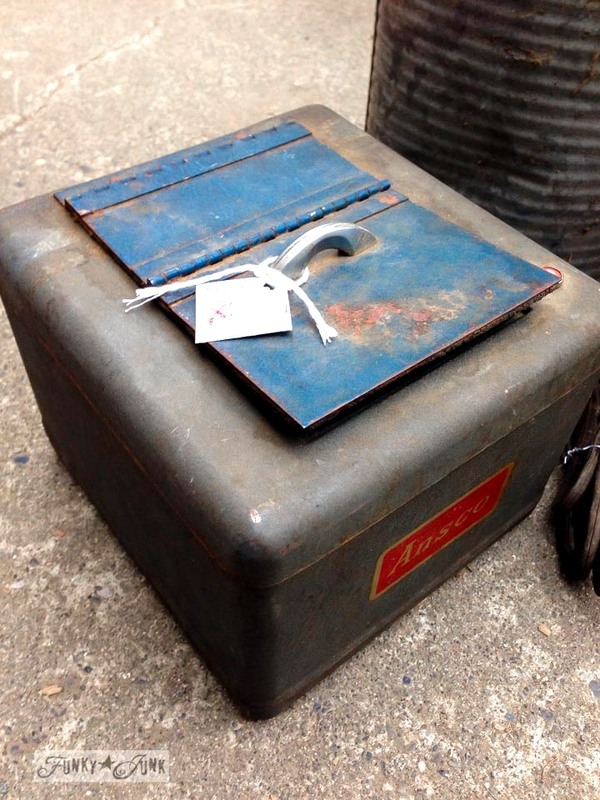 Metal box ~ sit it in a corner, or on a table and open the lids up and plug the lights in. 2. Galvanized watering can ~ I’d sit it on my deck, and use it to water flowers. 3. Gas can ~ Prob sit it on my deck on one of the shelves I have. 4. Trouble light ~ Hang it in the garage for when I need it. 5. 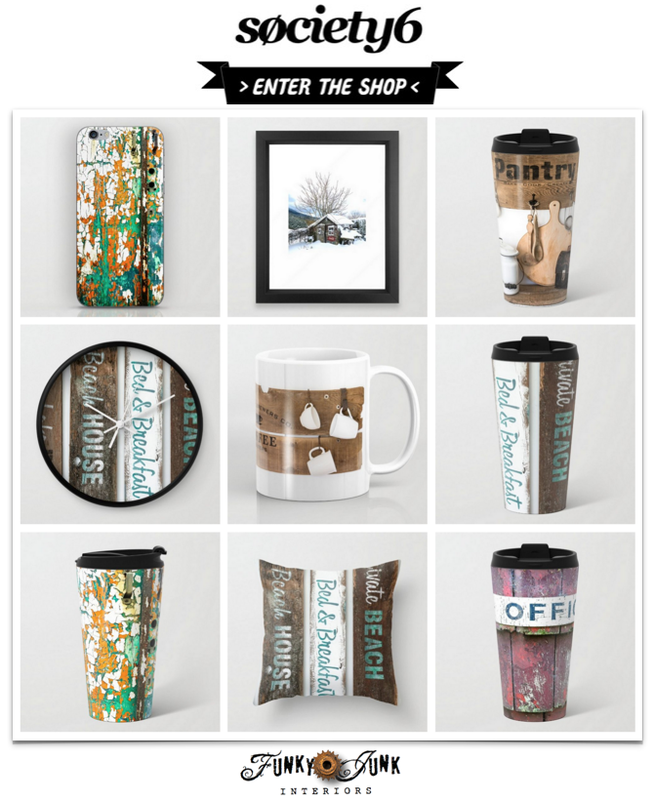 Bavarian Kitchen Circus ~ I’d totally use these ~ love them. 6. Vintage cameras ~ I do have a collection of vintage cameras ~ I move them around. Right now they’re on top of one of my glass cabinets. 7. Rusty hooks ~ not sure. 8. Model cars and trucks ~ kewel for a kid. 9. Restaurant dishes ~ love them ~ great idea for your camper. 10. Milk cans ~ sit it on the deck and put a plant on top of it. 11. Wooden shoes ~ not sure. *Metal box – Treasure chest of some type. *Watering can – Birdhouse! Turn it on it’s side and cut a hole on the side. *Bavarian Circus – I see something Anthropology inspired. Glue them together with different colored glass pieces…a candle holder perhaps? *Cameras – Make them into bookends, glue them onto wood pieces. The camera lens..glue one of those restaurant dishes on top..a display piece? candle holder? Take out the glass on one end and make a pencil holder. *Restaurant dishes – These last forever! Paint them, hang them on your wall, small ones make good plant saucers, large ones use for underliners for colorful plates at each place settings. *Milk cans – Make into a lamp (my dad did this years ago!, planters, holder for kindling wood. *Wooden shoes – drill holes in the bottom and plant Hens & Chicks! 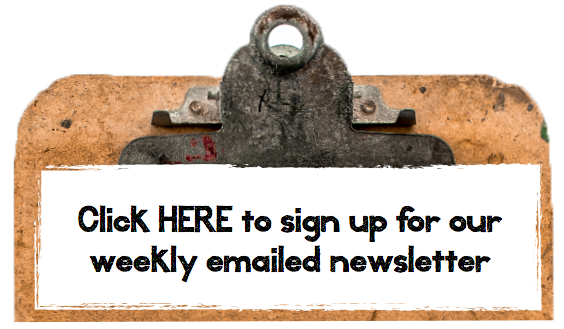 I’m dutch but I live in Italy and I love your newsletters. I live in Washington and have been to Leavenworth. Such an adorable place to visit. I use my hay hooks to hang pictures from. Since I’m always changing things around, they make it easy to have a new, unique look. The watering can I have used for the top of a fountain I made with small, round galvanized troughs. I loved the sound of the water being poured out from the spout and splattering the lower container. You always have such amazing ideas, I’m sure you’ll come up with something totally different and interesting with all the items listed. 1. Metal box…I am always looking for extra storage so I might pull out the electrical and keep small things in it. 2. 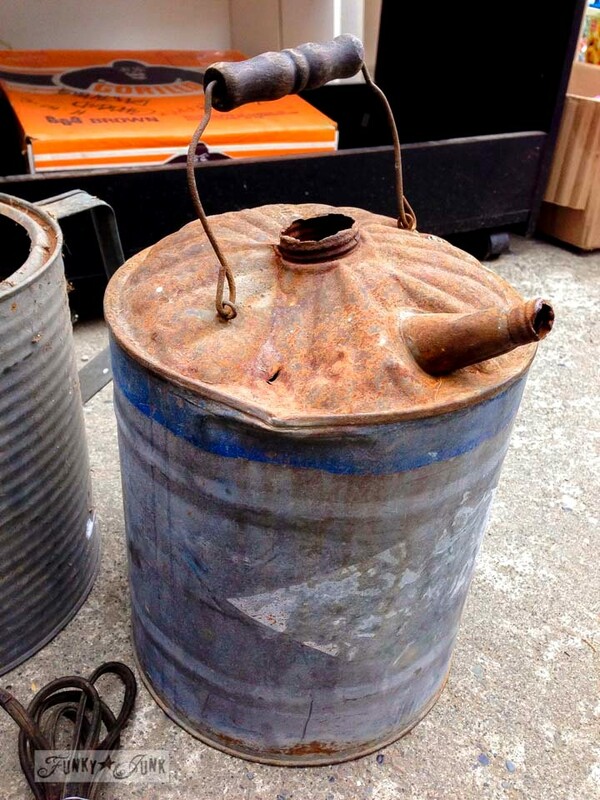 Galvanized watering can…a lamp or a planter? 3. Gas can… Love the lamp idea. 5. 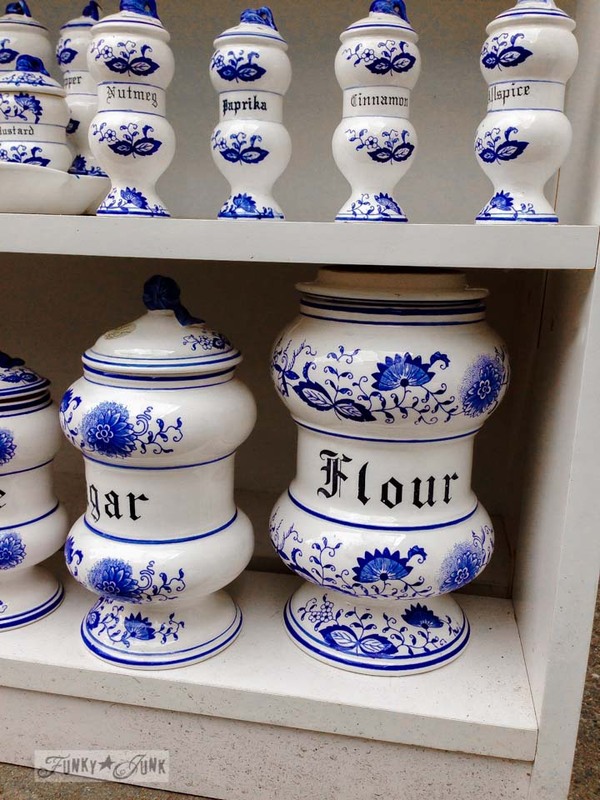 Bavarian Kitchen Circus… Cute, and I love blue and white, might have picked up the salt &pepper shakers. 6. Vintage cameras… Just as accessories on bookcase, but I was interested in the shelves they were on, always need more shelving. 7. Rusty hooks… My first thought was they were for hauling blocks of ice, back when they cut blocks from frozen lakes for ice boxes now known as refrigerators. Using to hold toilet paper in a rustic bathrm maybe? But you did mention they were sharp, probably pass. 9. 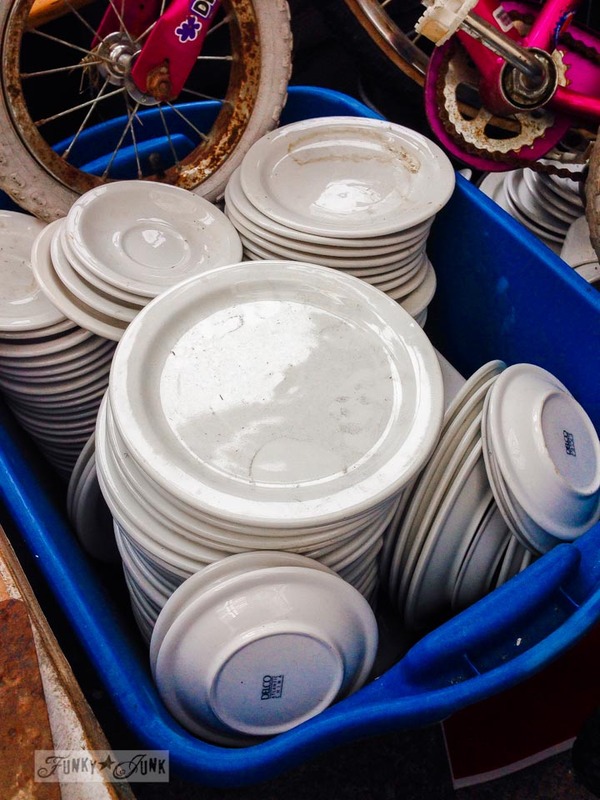 Restaurant dishes… I probably would have skipped these, I own way too many dishes now. Hooks – hang the dangerous part against the wall and use the pretty curled part for a towel….. Milk cans – attach an old round or square board to the top and call it an end or side table anywhere. Trouble light would look really cool in a boy’s room – attached to the headboard for reading maybe? 1. Metal box – if it works & can take a current bulb, how about a light for a small room. OR an up-light for a photo wall?! 2. Galvanized watering can – would look SUPER cute on one of those Pinterest inspired gardening tables! Use the hay hook to hold it. 4. Trouble light – (thinking man cave again) GOOD man cave light by a recliner! 7. Rusty hooks- beat the end till dull, hang on a cabinet to hold your favorite pot or pan Or..see #2. 9. Restaurant dishes – just good to have a few extra around when extra family come in? 11. Wooden shoes – I love what you did!!! I don’t have ideas for everything, these are great things that I see here and there, and am never sure what to do with them! I look forward to seeing what people come up with – my mom does have a milk can side table (just has a topper on it), but that’s nothing new. They look good filled with vintage rakes. I know there’s just the one trouble light, but I just saw an episode of Restaurant Impossible where the designer used a bunch of trouble lights hooked to a bike wheel for a chandelier – it was awesome! The other share I have isn’t on the list, but in the pictures – specifically the garage organizer behind the toy cars (LOVE the coroner’s car!!). 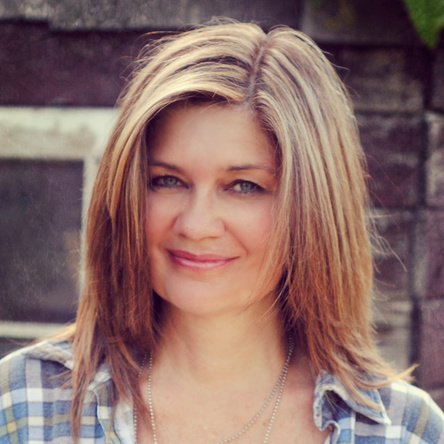 I recently saw a great makeover for one on http://www.serenitynowblog.com/. I see these things frequently, and am a bit of a container hoarder, but never know what to do with these! Hope it was ok to share that! I love what you did with the wooden shoes. The bale hooks are killing me, they are great! I think if I had them, I’d use them for my “shower” curtain. I have a clawfoot bathtub in a tiny bathroom, that needs a curtain for privacy when someone needs the toilet while the tub is being used. These would be great with some rope tied to each hook with the curtain attached! I use white dishes, so I’d just use the plates, though a whole wall covered in them would be cool, too. I live in Oregon, but have only gotten to stop for coffee in Leavenworth, it looks so fun! I have an old rusty family milk can that I used for an end table for a while. Just added a thick piece of round glass for a top that I picked up at the thrift store. (Little clear rubber dots kept it in place.). Put a large round doilie on it with a small vintage lamp & a couple other things. Loved it! Hay hooks would make great hangers for old pails full of flowers. I would make designs on the watering can by poking holes in it then using as a lighting element by putting a large candle in it, then using a chain and the “hook” to hang your new creation. For the cameras, #6, I would use the lens and flash areas as frames for vintage family photos, double duty collection to display. Would be col to match photo era with camera, ex. have 70’s photo displayed in 70’s camera. Love the wooden shoes as is and the trouble lights. Could you do a washi tape around light cord if used inside? Color and function, gotta love it. I have red painted hay hooks that need a (safe) use too, so I’ll be looking for ideas. Those large rusty hooks are definitely hay baling hooks. Ice tongs are different in that there are two handles and hooks together in an ‘X’ shape (like scissors). The rusty hooks look like meat hooks in a butcher shop. I have a hay hook, looks nothing like those. The watering can – I saw where someone put some bling in the spout of the watering can to mimick water and then hung the watering can from a sheepherders hook. I’m looking for a can. The hay hooks — one could hang an old bucket planted with pansies or some other flower that would trail down the bucket. That way one wouldn’t be in the way of the hook all the time. Used lots of these hayhooks when I was younger moving hay. I generally agree with the ideas previously posted for the various items on your list. The only original idea I would like to add would be to use the milk cans as bird baths. I would suggest taking the lid off one of the milk cans and add an old Chinese wok or some other rimmed lid that can hold water – them simply place the wok or rimmed lid on top of the milk can, add water and you have an easy bird bath. Place your new bird bath outside away from your cats. Wow, looks like fun. I think the hooks are ice hooks, too big for hay hooks. I have a set of each that were my father in laws, I hung one on the wal with a pair of his od work gloves on the hook. You could get a few meow trouble lights and use for hanging lighting at a bar where you could use the milk cans (if they are tall enough) as bar stools. My milk are 5 gallons, some are only 2 gallons. Some milk cans are only a half gallon there are only a few of those. Have fun with your treasures. Watering can and/or Gas can: a pole support for the deck umbrella under the table. Fill with plaster, pvc pipe big enough to hold the umbrella pole. Saw this somewhere, have a watering can and one day will do this. Each summer I use my old vintage cameras along with momentos from Yellowstone, (including a palm sized photo book from the 30’s I got at a yard sale for $2.00) old maps and things we loved to do when the kids were little like fishing flies, creels, an old oar, etc. and create a vacation themed fireplace mantle! The rusty hooks look like old ice block hooks! Might be nice to hang heavy, flower laden baskets! They would certainly be strong enough! – – –What would I do with ______? 2. Galvanized watering can: Have one already, added fake plants to it, sits on top of my cabinets.. it would also make a nice lamp. What would I do with…? 1. Metal Box – If the lights work-use as light fixture or night-light, depending on brightness of bulbs – wall-mount or table. If lights don’t work or empty inside- storage. 2.Watering Can – Use as watering can! If leaky- vase w/ water jar or tin can inside. Or dried arrangement. Or “as-is” for garden/porch ornament. 3.Gas Can – Lamp base-I have jillions of lamp ideas for my next incarnation! Or as-is for garden or porch. 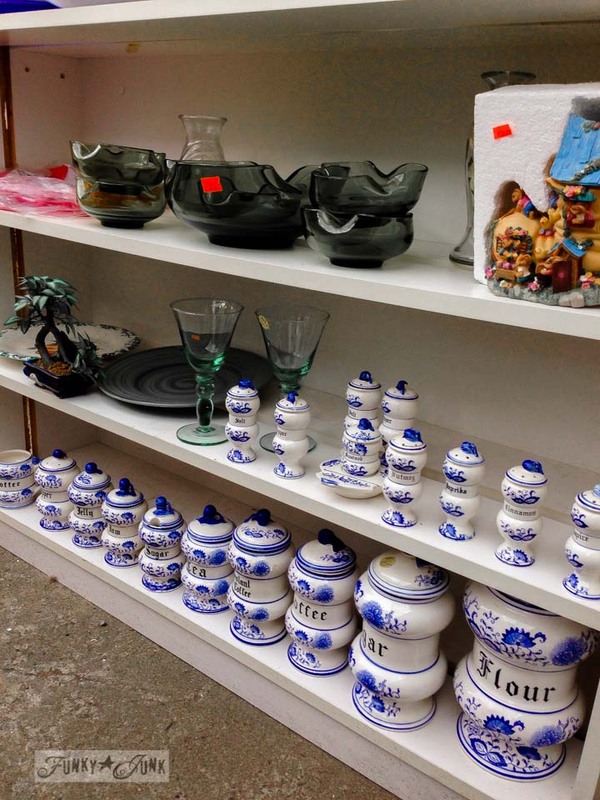 5.Bavarian Ware – Lamp bases – w/lids as finials/toppers! Vases! Original idea: kitchen canisters-LOL! Storage. 6.Cameras- ? Cool for display; can’t think of another use. 7.Rusty Hooks – hang high for safety- suspend planters w. trailing plants or seasonal arrangements/vignettes! 9.Restaurant Dishes – MY 2nd FAVE ON LIST-would be my #1 except for the fact that…I collect these! The chunkier the better! I have hundreds & use them for EVERYTHING – eating, of course! PLUS: vases, make-up/toothbrush holder, entryway-keys/mail/coins), multiples in wall display, office- pencil holder (you’d covet my gorgeous square ironstone divided portion plates to organize desk items- imagine paper clips & pushpins where the Blue Plate Special used to be served!) So versatile! 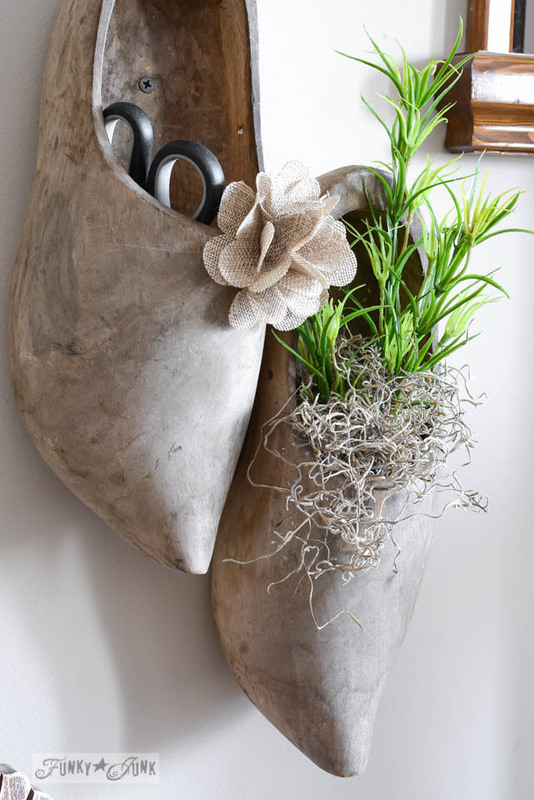 11.Wooden Shoes – ♥ your cute idea – change w/ seasons- a little wooden egg, rusty ♥, mini-pumpkin, tarnished xmas ball, etc. What are your favorite reader ideas for each item on the list? I love the wooden shoes! We had some that were painted when I was kid. I used to wear them around the house and was so sad when they wouldn’t go on my feet anymore. I love them hanging on your wall. Love the milk cans, big wildflowers would be gorgeous. The hooks are sort of scary. They remind of The Shining or something. Sorry! Would love to know what that box is. I have come home with things I have found that are old and rusty, probably old farm implements and have no idea what they are sometimes. The metal hooks could easily be made safer….and would make lovely towel holders…curtain rod holders, etc. Simply drill a hole in a small cube or circle of wood….or a small slice if tree branch….and hot glue over the sharp ends!